Historic Sandusky has received four regional Emmy® nominations for its documentary film, Hunter’s Raid: The Battle for Lynchburg, which included roles for several LC faculty, staff, and students. University of Lynchburg announced a partnership with the nearby Civil War site in December 2011. The film, which debuted in May 2010, was nominated in the categories of Documentary – Historical; Audio; Director – Post Production; Editor – Program (Non-News). View the trailer. The nominations were announced by the National Capital Chesapeake Bay Chapter of the National Academy of Television Arts and Sciences. Winners will be announced June 16 at the 54th Emmy® Awards event in Washington, D.C. 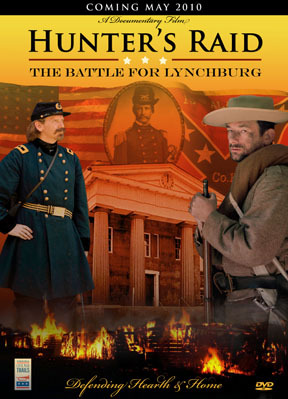 Written and directed by Historic Sandusky Executive Director Greg Starbuck, the 55-minute documentary describes the tense days in June 1864 when Gen. David Hunter and his army of 18,000 Union soldiers are ordered to capture Lynchburg. The Sandusky house was commandeered by Hunter as union army headquarters, but Hunter was driven out of Lynchburg by Confederate Gen. Jubal Early, saving the Hill City from major destruction. The development of the non-profit partnership between Sandusky and LC will honor the mission of the Historic Sandusky Foundation, which is to preserve and interpret the Sandusky site as a public museum and to collect, preserve and disseminate information about the history of Sandusky, its inhabitants, and the role of Lynchburg in the Civil War. Starbuck continues his role as executive director of Historic Sandusky while Barbara Rothermel, director of LC’s Daura Gallery, serves on the Foundation Board of Historic Sandusky.